This weekend I made a new dress for Evie. The weather is heating up here in Texas and we seem to be short on summer clothes for Evie. 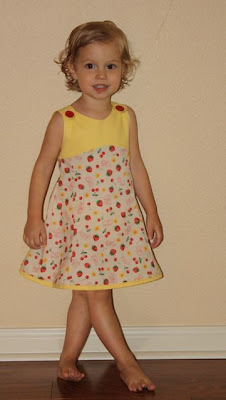 The pattern is the Oliver + S Tea Party Sundress. They rate the pattern as 1 out of 4 scissors (so, easy). I'm not sure I agree. Yes, the dress sews up pretty quickly... that is until you get to the facing. This isn't hard per se, but it's a bit confusing. You have to hand stitch the facing to the dress, which is time consuming. The pattern designer writes a tutorial here, which I would recommend if you need help with the facing. Or you could skip this step all together and finish it with bias tape like I did when I made this dress for Indigo last summer. This was my first attempt at making bloomers. The swear factor on these was surprisingly high, as they look relatively easy. The leg binding was a little tricky. I would recommend cutting the bias strip 1/2" larger and serging (rather than folding) the edge. Liesl (the pattern designer) writes great instructions and her patterns really are like taking a sewing class. I highly recommend them and learned a lot making this dress. My cares melt away as we work together. You enable me to get something done that actually stays done. Wow! It's so cute! I can do a straight stitch and that's about the most of my sewing ability. You did good! Beautiful dress for a beautiful girl!!! I haven't sewn a stitch in about a month and I miss it! I've looked at Oliver + S patterns, but they are really expensive. I guess if I used them repeatedly it would recoup the cost. Lovin' your ode! Gorgeous dress! They have that fabric and its companions at Seventh Heaven Quilt shop, should you need more. 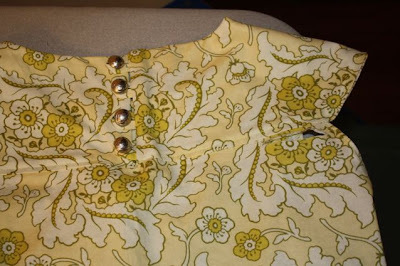 I have admired this dress pattern before. Not sure I am up for handstitching, but it's pretty darn cute so I would probably still go for it. Thanks for the great review! Totally adorable. Nothing about that dress looks easy. I wish I had your sewing ability! Oh, I'd say you and your sewing machine are 'good friends;-). LOVE the material, and the dress looks perfectly beautiful on Evie. Wow. Your 'swear factor' part...gave me a chuckle...thanks. So pretty and the colors are beautiful against her skin! Loving the ode to the sewing machine. Especially the part about getting things done and them staying...done. Can't wait to see what else you turn out! That dress is SO cute and the bottom are adorable! I can't believe ho big E is getting, what a sweet girl!